Janet Kay Jensen | The Official Website of Janet Kay Jensen, Author. Suppose a young woman is raised in a sheltered polygamous community in which a woman’s only purpose is to marry young and produce and raise many children for her husband, a man she must share with one or more other women? What would happen if she leaves this life rather than submit to its tenants? And how, with limited education, could she learn to support herself in the “evil” outside world of the “Gentiles?” These and many other questions led to the storyline of Gabriel’s Daughters. 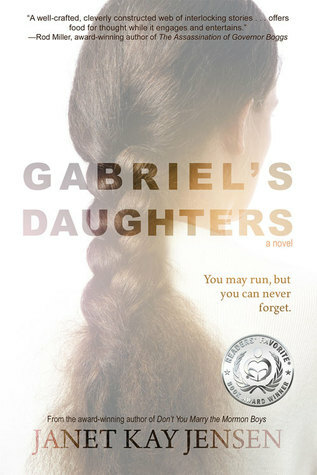 Janet Kay Jensen, author of the award-winning novel Gabriel’s Daughters, sheds light on the puzzling, mysterious, and often disturbing lifestyle of polygamy from numerous viewpoints. Released January 20, 2015 by Jolly Fish Press, Jensen’s novel tells the story of sixteen year-old Zina Martin, who runs away from home in the fictitious town of Gabriel’s Landing, when she learns she is promised as a plural wife to a man with four other wives and children older than she is. Pregnant by the high school teacher who seduced and then abandoned her, Zina’s only option is to run. Unprepared for the outside world of the “Gentiles,” she must set out on her own course of self-discovery, maturity, time and trust in order to eventually reconnect with her beloved family . Jensen has been fascinated with the subculture of polygamy since childhood, when she first heard the folksong, “Don’t You Marry the Mormon Boys,” which, incidentally, is the title of her first novel (Gabriel’s Daughters is the sequel). Hearing tales of her own Utah pioneer ancestry, some of whom were polygamist, and occasionally encountering members of these secretive communities as a resident of Utah, she began to research the subject. Reading about a young wife who left a polygamist group to attend college, and then became valedictorian of her class, further fueled Jensen’s imagination. Janet Kay Jensen is co-author of The Book Lover’s Cookbook (Ballantine, 2003) and Don’t You Marry the Mormon Boys (Bonneville Books, 2007). Her work also appears in Writing for Charity, Healing Ministry Journal, and Parables for Our Times.